Prestigious law firm Dewey & LeBoeuf files for bankruptcy protection, does not plan on re-opening for business. 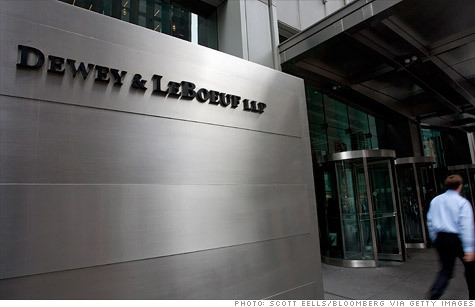 NEW YORK (CNNMoney) -- The long decline of Dewey & LeBoeuf ended as the foundering law firm filed for bankruptcy protection in federal court in New York. A press release issued late Monday by the firm indicated the filing was made in order to "preserve assets and wind down its business in the most orderly and efficient way possible." The firm said it is not planning a return to business, and instead will liquidate. The firm's creditors number in the thousands and its liabilities range from $100 million to $500 million, according to court documents filed in the Southern District of New York. The firm also lists assets of between $100 million to $500 million. The bankruptcy filing comes after a substantial number of partners left the firm in a massive collapse that ranks among the professions' most high-profile failures. "We are proud of the dedication and professionalism that has characterized Dewey & LeBoeuf over many years, and we intend to bring the same focus to the unfortunate task of closing out our affairs," Stephen Horvath, the firm's executive partner, said in a statement. The firm, which at one point employed more than 1,100 lawyers in 26 offices, said it would ask the bankruptcy court for permission to keep 90 workers on to help wind down the business. Among the firm's biggest clients is baseball's Los Angeles Dodgers, which it represented through the team's own bankruptcy filing last year and its proposed $2 billion purchase earlier this year by a group that includes former basketball star Earvin "Magic" Johnson.